The ceiling is the part of a room that is sometimes overlooked. However, there are many different ways that you can create visual interest in a room just by adding a design to the ceiling alone. Updating the look of a room by transforming a plain ceiling is fairly simple as this can be done to an existing space or during construction. A ceiling's design can enhance or completely transform any room. Coffered, also referred to as panel or recessed ceiling, is a sunken panel in a ceiling that usually forms a grid of squares, rectangles, or octagons. The effect of intersecting beams range from having a simple design to elaborate details. A coffered ceiling, which works best in large rooms, creates a look and feel of elegance and formality. It also creates a dramatic effect and visual depth in a space. The panels may be painted to coordinate with the color scheme of a room. Transform plain ceilings with three-dimensional, patterned ceiling tiles. Patterned tiles are available in many designs, such as brick, stone, wood, stucco, or floral, and can coordinate with patterns that already exist in a room. Patterns such as brick, stone, and wood can create a warm and rustic look and feel in a room, while a botanical or floral motif is more traditional. Choose a patterned ceiling if you want to add dimension to a room, especially in a space like a living room or dining room. Patterned ceilings are great for large rooms, but should be limited to no more than two different patterns for a uniform look. Keep scale and proportion in mind by using a larger pattern in larger room with high ceilings and vice versa. Likewise, the whole ceiling does not have to be covered in pattern, such as limiting patterns to the center or perimeter, especially in smaller rooms. Textured ceilings add dimension to a room and may be achieved in different ways. Some of the more common ways to create a textured ceiling is by using pre-textured paint, thickened paint, or a textured roller. Adding materials to latex or oil based paint, such as sand or joint compound as well as using a rag or a sponge with contrasting colors of paint can also create a textured appearance to a ceiling. Some textured effects include popcorn or cottage cheese, splatter, orange peel, swirl, and stucco. Adding texture to a ceiling, which works well in large or small rooms, does not only add visual interest, but is one way to hide imperfections. Metal ceilings are best when you want to create a historic look, much like the tin ceilings prevalent in 19th century. 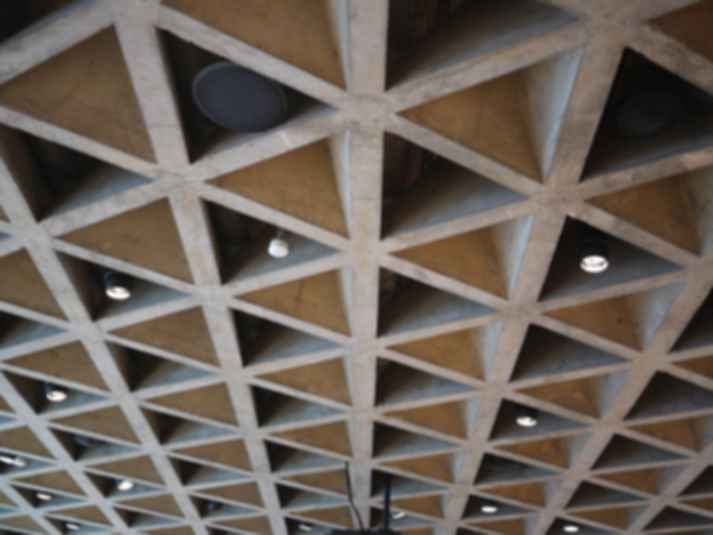 However, metal ceilings are also used in contemporary spaces and create a dramatic effect. Decorative metal ceiling panels are available in a wide range of metals including steel, copper, brass, chrome, and aluminum. They are also available in bare, polished, and powder coated finishes. Metal ceilings are great for creating visual interest especially in large rooms with high ceilings. They are often found in entryways but may also be used in living rooms, dining rooms, and kitchens. Metal panels are an excellent choice not only for the way they enhance the look of a room, but because of its durability. Metal ceiling panels do not rot or crack, retain their shape, are fire and moisture resistant, and easy to install. They may also be painted to match the color scheme of a room. Share some other ceilings types you would like to include to this list and how it transforms the room/space.